This interacting group contains several galaxies along with a "cosmic fountain" of stars, gas and dust that stretches over 100 000 light years. Over the past 19 years Hubble has taken dozens of exotic pictures of galaxies going "bump in the night" as they collide with each other and have a variety of close encounters of the galactic kind. Just when you thought these interactions couldn’t look any stranger, this image of a trio of galaxies, called Arp 194, looks as if of the galaxies has sprung a leak. The bright blue streamer is really a stretched spiral arm full of newborn blue stars. 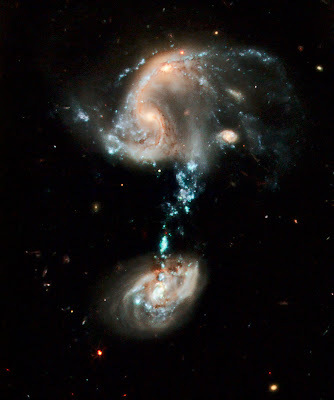 This typically happens when two galaxies interact and tug at each other gravitationally. In bed by 7 last night, lights off by 8. Kate promptly fell fast asleep, and I went into that aggravating half-awake-half-asleep-waiting-for-the-alarm-to-ring-never-never-land. We both woke up at 11:45 for some reason, but fell back to sleep until the alarm went off at 1:45am. Coffee and shower, hurried last minute review of notes, and the limo arrived at 2:45. Not much talk in the car, re-read notes wondering what to expect. Asked the driver if this was the main Fox station or was there another downtown. He said where we were going was a contract video studio used for remotes, basically just a room and a camera. And that's what it was. You'd recognize the camera man instantly. He was the geeky kid that belonged to the AV club in high school and ran the projector when there was a movie in class, just older.